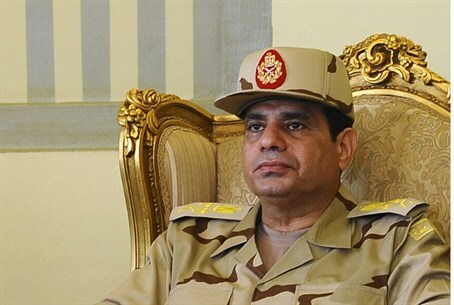 Egyptian army chief reportedly confirms to Kuwaiti newspaper that he will run for president. Egyptian army chief Abdel Fattah al-Sisi has said he will run for president, Reuters reported on Wednesday, citing a Kuwaiti newspaper. The Al-Seyassah daily quoted Sisi as saying that he had no alternative but to meet the demands of the Egyptian people for him to run in the elections, which are due within six months. There have been speculations for months that Sisi, who led the revolution that toppled Islamist President Mohammed Morsi in July, will run for the presidency. Sisi is wildly popular for overthrowing Morsi and last week he received the backing of Egypt's top military body to run for president. The Supreme Council of the Armed Forces said last week that "the people's trust in Sisi is a call that must be heeded as the free choice of the people. " Sisi took the approval of the constitution last month as a vote of confidence for his presidential bid. He has also been supported by Egypt’s interim Prime Minister Hazem el-Beblawi.